Quasiparticles that behave like massless fermions, known as Weyl fermions, have been at the center of a string of exciting findings in condensed matter physics in recent years. The group of physicist Sebastian Huber at ETH Zurich now reports experiments in which they got a handle on one of the defining properties of Weyl fermions—their chirality. "In my work, I have always tried to unite the true with the beautiful; when I had to decide for one of them, I have always chosen what was beautiful." This quote adorns the wall of a niche in the Hermann Weyl room in the main building of ETH Zurich, behind a sculpture of the German mathematician, physicist and philosopher Hermann Weyl, who was a professor for higher mathematics at ETH from 1913 to 1930. During that time, Weyl produced a relativistic wave equation for describing massless spin-1/2 particles, which are now known as Weyl fermions. Reporting today in the journal Nature Physics, Valerio Peri and his colleague Marc Serra-Garcia in the group of Sebastian Huber at the Institute for Theoretical Physics of ETH Zurich, together with Roni Ilan from Tel-Aviv University (Israel), report an experimental study in which they have observed an intriguing and conceptually far-reaching feature of Weyl's time-honoured theory: a possible background field that couples differently to Weyl fermions of opposite chirality. Massless fermions have never been observed in nature. Today, we know that Weyl fermions emerge as collective excitations, so-called quasiparticles, in many-body systems. This was realized experimentally in 2015 in a crystalline material, in which Weyl fermions appear as specific points in the electronic band structure. Such Weyl points have also been shown to exist in engineered periodic structures interacting with classical waves, in particular with electromagnetic waves (in photonic crystals) and with acoustic waves (in phononic crystals). 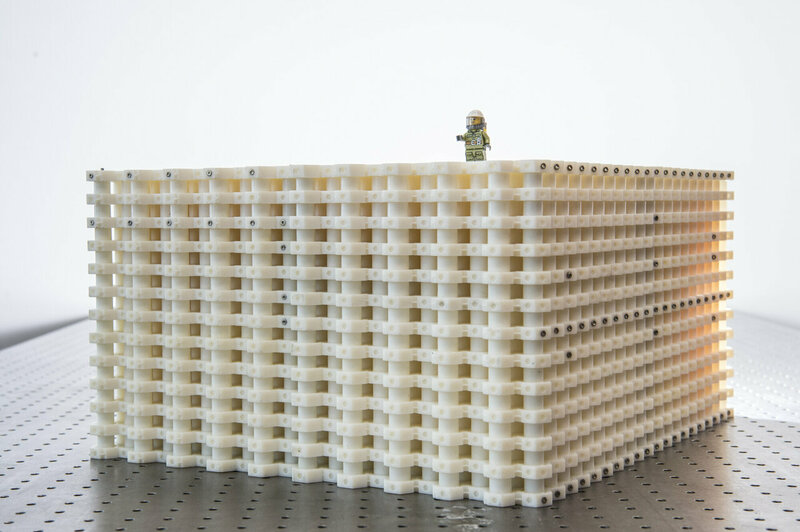 Peri and co-workers adopted a phononic platform, consisting of 4800 carefully designed, 3-D-printed unit cells arranged in a 3-D structure (pictured above), in which they interact with airborne sound waves. 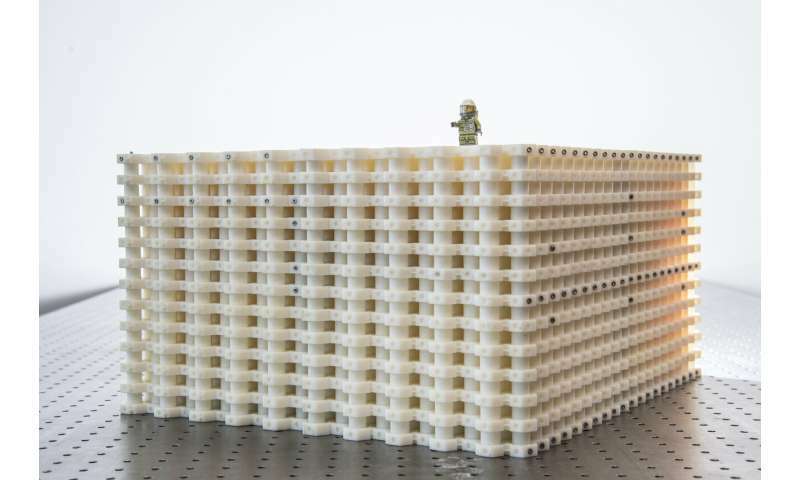 Such acoustic metamaterials have been known as suitable platforms to explore Weyl physics, but the ETH researchers added an important spin to the story. They engineered a background field that interacts with the Weyl fermions in a manner similar to how a magnetic field interacts with electronic excitations in a crystal. As sound waves carry no charge, and are therefore inert to magnetic fields, Peri et al. had to find other means of manipulating the quasiparticles in their system. They did so by slightly varying the geometry of the unit cells, such that the spatial location at which the Weyl points appear (in momentum space) varied throughout the sample. This modification makes their acoustic system behave like an electronic system immersed in a magnetic field—with an important difference. They designed the background field such that it couples differently to the two types of Weyl fermions: those with intrinsic angular momentum (spin) aligned parallel with their linear momentum, and those with anti-parallel alignment. In other words, the field couples differently to particles depending on their chirality. The realization of a background field that distinguishes chirality is an important step, as it goes to the heart of why the Weyl fermions are so exciting in particle physics. When fermions of different chirality can be manipulated independently of one another, then classical conservation laws can be broken at the quantum level. For instance, the charge for fermions of a given chirality is not conserved. Such behaviour gives rise to the so-called chiral anomaly, which in turn might be the key to understanding central features of the Standard Model of particle physics. Peri and colleagues have now demonstrated the existence of distinct chiral channels, giving them independent access to Weyl fermions of opposite chirality in a bulk system. (Related results have previously been reported for electronic systems in two dimensions.) Having realized such behaviour deeply rooted in the theory of high-energy physics with low-energy sound waves interacting with a condensed-matter system promises a versatile platform for further exploring phenomena related to Weyl fermions that have been theoretically predicted, and to take further steps towards exploiting such behaviour in technological areas, ranging from acoustics to electronics—without losing sight of the underlying beauty that guided Hermann Weyl.